People have always had a problem organizing vast amounts of information. In the 90s, we took important notes in our PDAs. We'd jot stuff down in notebooks that would end up on a shelf somewhere. With the advent of the smartphone and mobile tablets, there was a need for something that would synchronize all of this previously useless information across all of our devices. Evernote acts as that digital brain. With 20 million users, Evernote is by far one of the most popular organizing and note-taking applications. Its ease of use and minimalistic approach are two major reasons. The basic version of Evernote is all the average business user should need. You can save and tag audio, ink, photo, or video notes, and share these and your favorite Web addresses across all of your devices. The free service comes with 60MB of file uploads per month. It makes every random thought you jot down searchable--including optical character recognition of handwriting--making it essentially a mini-Google of your life. It allows you to share your notebooks with other users if you're on Android or the desktop version, and individual notes if you are in iOS. Evernote can run on nearly any device. Evernote has a great guide for installation on all of your devices and setting up your first notebooks and notes. Evernote does lack items like basic formatting that could turn it into a full-scale productivity app. Yet, Evernote Premium does integrate with QuickOffice, and the two make a powerful productivity app for a tablet. 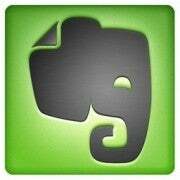 The premium version of Evernote is cheap for the frequent user at $45.00 per year. This allows you to secure access to your notes with a password on its mobile apps, take your notebooks offline to your mobile devices, increase your upload limit to 1GB, search within PDFs, and many other items. Wait, Isn't OneNote the Same Deal? Microsoft's OneNote was the dominant leader in this space until Evernote came along, and is still the go-to program for those used to it. Many of its features are exactly the same as Evernote's, right down to the terminology of notebooks and tags. What separates the two? While OneNote may be a mainstay for desktop and laptop users of Microsoft Office, Evernote can be installed across all platforms and on all mobile devices. OneNote may have started the concept, but Evernote is running with it. 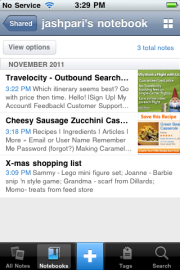 Evernote has just released two new apps for iOS: Evernote Food and Evernote Hello. Food catalogs the food you're eating or want to eat, and Hello is a contact manager--something that non-iOS users of Evernote will want. Students can extend the functionality of Evernote with the free Evernote Peek, which works with the iPad 2's smart cover to give you clues to help memorize content you're studying. And a free premium year of Evernote comes bundled with the Livescribe "smartpen"--from which you can send handwritten, digital notes to Evernote.